Save when you buy direct from this Certified John Lyons Trainer! A very detailed publication containing 30 of John’s most important ground lessons. 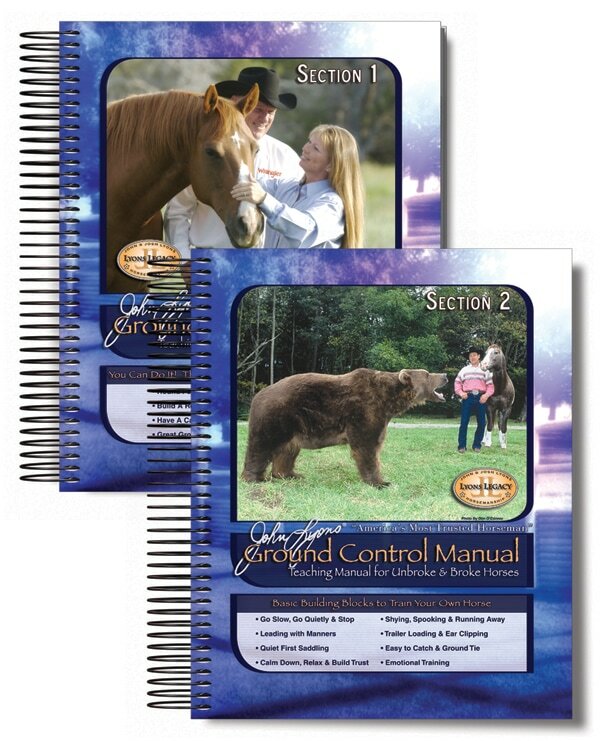 Divided into separate two manuals, the principles contained in John Lyons' "Ground Control Manual" can be used successfully over and over for any and every horse. Train your horse yourself with the help of this terrific, comprehensive manual. Newly revised and now spiral bound, the John Lyons Ground Control Manual contains over 30 of John's most important ground lessons. Perfect for green horses or for older horses that need their ground skills polished. This is the only publication of its kind and one remarkable study guide. The John Lyons Ground Control Manual is a very detailed publication containing John's most important ground lessons. The manual is divided into two sections. Section 1 contains John's important but essential training principles and philosophies. This is significant because the principles behind the teaching are what make any lesson successful. You will also find the first 10 training lessons in Section 1. In Section 2 you will find the remainder of the training lessons, 20 in all, to complete this comprehensive ground training source. There are many pictures to illustrate the steps to each lesson. This will help you with the problem-solving process to teach and refine your horse's performance. Each lesson has specific organization, and you will find a Teaching Preparation page that contains: an overview of the lesson, prerequisites that are recommended, an observable response that you should see at the end of the lesson, equipment that is needed, and additional important points. You will also find training cards for you to take to your training area for a convenient reference. At the end of each lesson you will find a "What If ..." section. This will help with commonly asked questions or special situations that you may encounter. There is a Check Sheet to record your progress for the day. Lastly, each section has review questions about each lesson to help you to check your understanding. ​SORRY, I DO NOT SHIP INTERNATIONALLY (INCLUDING CANADA).